Unfortunately Olympus have not been offering lenses with the same flair (I must be sure to spell that correctly!) as their old Zuiko optics. So I have resorted to finding legacy lenses on "the internets", an annoying process that involves out-bidding thousands of other photographers with similar thoughts. But sometimes you find a deal (this being the carrot to the internet mules -- but I digress). At this point you might want to look back at Choosing An Alternative Mount Lens for an ILM Camera for how I narrowed my lens search. The G. Zuiko 40/1.4 is one of the most popular choices for lenses to adapt, since it offers an excellent optic in a compact size (43mm in length and 165g) -- and it has a fast maximum aperture. It requires an inexpensive ($20) and tiny 9mm adapter for use on MFT bodies. First, I set up the Olympus E-P1 on a tripod with the timer function, using natural light on an overcast day when illumination was not varying. Using the close focus distance of 35mm, I focused on an arrangement of seashells, so the effects of depth of field and bokeh could be seen. Here are the results for each stop from f/1.4 to f/4. You'll want to click through to Flickr to see them larger. If you do, check out the adjacent images for the remainder of the stops. From this I conclude there is no problem with the lens in this regard. All digital images need appropriate post-processing just as all film stocks need appropriate development. Now I will present the results of the bookshelf test. learning from the previous exercise I compensated for the exposure so as to get comparable results. In this case I discovered that I needed to begin compensating immediately and consistently on stopping down, adding one-third of an EV positive compensation per stop. 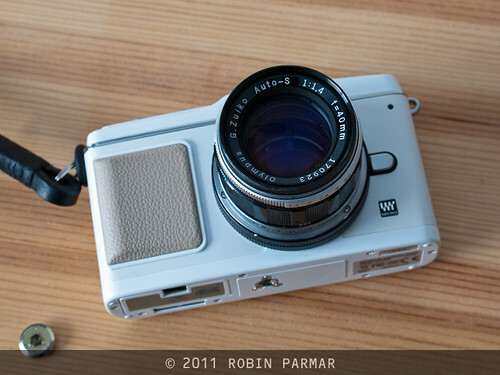 In practice this will be annoying and definitely sap some of the joy of using the Zuiko. As you can see, the white balance was off, so this was not an effective test of colour rendition. In other regards it conforms with the results from the first test. Join me soon for Part 2, in which I present some real-world shots and my subjective impressions of the lens.